I'd never heard of Mirus perfumes until I visited Tigerlily in San Francisco this July; a sales assistant insisted I sample the Northern California-based line. I was so taken with Mirus Wicked Stepmother, I included it in my Top 10 Summer Fragrances 2016 post. Driftwood is the latest perfume from Mirus and it's perfect for late-summer/early-autumn wear. Driftwood opens with cedar (this cedar has a pleasing hint of dill); pepper arrives and departs quickly and then sandalwood comes to the fore. Driftwood's sandalwood is smooth, but it also possesses that necessary mustiness one gets from real driftwood found on a beach (salty-damp wood). I currently work at an American Indian organization and Driftwood got raves from a staff that loves rituals involving cleansing with wood smoke or cedar leaf dipped in salt water. A friend, new to perfume, asked me to recommend five "cozy" fragrances to wear this fall and winter that won't "scare" her husband; I included Driftwood on the list. Mirus Wicked Stepmother and Driftwood have good sillage and lasting power; the perfumes are created by Mirus owner Neal Peters and are available at Tigerlily (15 ml Parfum Extrait; $65). 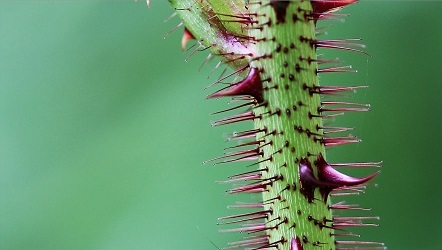 Note: top image is Rubus sumatranus stem [cropped] via Wikimedia Commons. Kalyazin…have no idea, I didn’t even know he had his own fragrance till I read your comment! Have you compare both the packages of Tom Ford’s Extreme and C.R.’s Legacy? Kevin, I’m not really very good at imagining the smell of a perfume from its notes, but I can totally get its personality from a review like your one of Wicked Stepmother. I really appreciate the way you wrote it. The perfume sounds fabulous, as though it has a distinct and distinctive presence. I’d like to think I could carry off such a scent, but I suspect it might be more assertive than I am, and that would never do! Great review–made me think AND laugh. Thank you! Waterdragon, thanks…glad you enjoyed it. These do sound interesting, and 15-ml is the perfect size. Will try to sample both of them. Sounds like you’d have to be careful what you layered it with. The notes sound really interesting, actually. jjlook: I’m hoping the lubrication of joints points us to the realm of tongue in cheek…a funny way to present a ‘sport’ fragrance for sure. Noz: HAHAHAHA! I’ll have to try that next time I’m in Nordstrom; I’ve liked most of the House of Matriarch scents I’ve tried, though. They’re probably just using some kind of off-the-shelf software, Koenigsberg. OTOH, since they made a Wicked Stepmother perfume, I guess we can’t completely exclude the possibility that they set it up that way deliberately just to annoy you. Ha! Yes! They’re out to get me, I can feel it in my bones! Koenigsberg: I’m betting the range will soon be available at bigger online retailers. I read through all the descriptions and it does come across as a range worth sampling. Even the Citrea scent has some notes that elevate it out of the usual citrus schlock. I’m squealing with delight over these reviews, Kevin! I hope that I get a chance to try these. I wonder if Neal Peters will add other family members into the mix – that would be such fun! I’m sure we could all come up with a few naughty suggestions for Mirus to explore. I’m always open to suggestions.